A fruity, roasty & smooth brown ale. Brewed with Finca Santa Isabel coffee. 330ml bottle. Opaque, dark brown colour with average to huge, frothy, moderately lasting, minimally lacing, off-white to beige head. Grassy hoppy and nuttily malty aroma, "background-ish" hints of coffee, minimally waxy, hoppy overtones with a touch of orange, orange peel. Taste is fruity and slightly grassy hoppy, nuttily malty, hints of coffee, red berries, some orange and mandarine. 200ml on tap at Cafe Sara. A low beige head blanketing the glass. Coal black body. Prominent coffee to the nose, roasted. Coffee up front to the taste profile, together with moments of earth, oily hops, and dried fruits. Roasted malty ending, semi-sweet. Easy to drink. Pleasant. (Oslo 08.02.2018). September 16, 2017 with harrisoni and lagerloather - at Brew By Numbers - draught keg. Deep, cloudy reddish-brown with a decent tan head. Smells like ... coffee; and nutshell - that's it, although maybe a little nougat: lush. Taste follows - but less malty and full-on coffee, some rye toast - dry and a bit burnt. Average body, airy, finishes quick, dry yet that nougat sweetness is there in the linger. 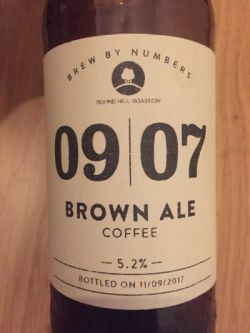 Not your normal brown ale, but I liked it a lot. On tap at Stone Berlin. A dark brown beer with a small white head. Aroma of nutty hops, caramel, coffee, milk. Taste of milk chocolate, coffee, lactose, roasted bitter finish. Vom Fass im Stone Brewing Berlin 2018-01 getrunken. Ein Mokka Black Pale Ale würde das recht süffige Bier besser beschreiben denn hinter einer feinen Citrusnote und moderaten Hopfenbitterkeit runden ein Mokkaaroma diese Ale sehr gut ab. Murky dark brown, thin quickly disappearing head. Citrus, gooseberry, pine, coffee. Coffee, fruity, medium bitterness, quite soft carbonation. Quiteba surprising mélange of exotic fruit and coffee flavours. 330ml bottle. Pours very dark brown, large beige head. Strong coffee aroma with citrus/tropical fruit hops, roast, caramel. Taste is dominated by coffee, roast malt, chocolate, fruits, caramel, pine. Medium body, oily texture, a little thin, soft carbonation. Well hopped, almost like a Black IPA, very nice. Bottle from Park Fever, Hither Green. Black pour with a beige head. Coffee, Light smoke, caramel, toffee and raisin aroma. Flavours of dark roast coffee, toffee, prunes, plum pudding. Sweet, dark fruit linger. Good. Keg at Heidrun, 04/11/17. Rich mahogany brown with a decent beige covering. Nose is coffee grinds, earthy notes, toffee, light spice, dried fruits, sultanas. Taste comprises light roast, treacle toffee, light spice, dried fruits, brown bread, coffee grinds. Medium bodied, fine carbonation, semi drying close. Solid for style. Another coffee win for BBno!